Cameco, one of the world’s largest uranium producers, sees opportunity in the 250 million pounds of new uranium production the company believes is required to meet demand over the next 10 years. And there isn’t a lot of competition given the high barriers to entry in the business — including 10-year lead times to obtain permits and dig new mines. To help meet heightened demand, Cameco plans to grow its production by roughly 10% a year through 2018. They currently supply 16% of global uranium production. Over one hundred new nuclear reactors are expected to come on line over the next decade worldwide, half of them in China alone, with India and Russia having aggressive build-out plans as well. According to the publication China Daily, the former director of China’s National Energy Administration says that China may expand its 10-year nuclear plant ambitions even more from 80 gigawatts currently planned to 86 gigawatts. The World Nuclear Association says China’s demand for uranium is expected to reach 44 million pounds annually by 2020, but domestic supply will only reach 5 million pounds by that time. From all this new demand, industry consultants expect the global uranium market to grow from about 190 millions pounds currently to 247 million pounds by 2020. Secondary uranium sources, like governments’ conversion of explosives-grade uranium to electricity-grade uranium, are expected to decline from about 48 million pounds today to 24 million pounds by 2020. In combination, the growing demand with declining secondary sources suggests 5-6%% annual demand growth for uranium from mined sources over the next decade. It is well known that existing supply from uranium mines cannot meet the anticipated demand; Cameco estimates that 18% of total supply over the next ten years will come from new sources. Afraid of the upcoming supply shortage, China has been aggressively pursuing long-term contracts for uranium. 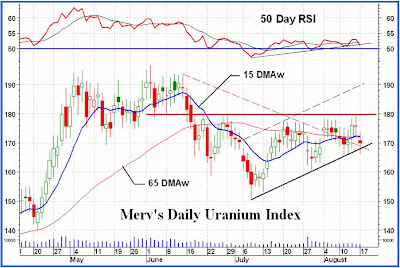 Industry participants believe it is largely China that is responsible for driving spot uranium prices from $40.75 in May 2010 to $72.25 today. Even so, the cost of uranium fuel at today’s prices, which includes the cost of processing it into fuel rods, only represents about 20-25% of the total cost of generating electricity at the more efficient nuclear plants currently planned and under construction, compared to 40-50% for existing plants. Given the efficiency of the new technology, it follows that Chinese planners are likely unfazed by the recent price increases and uranium prices could more than double from current levels before giving the Chinese pause, especially given their history of aggressive behavior in other nation-critical mineral areas like rare earth metals. With their 80 to 86 gigawatts production targets, the Chinese will pull out all stops to lock in their long-term supply of uranium. Inevitably, India and Russia will be forced to enter the bidding war to get their share of supply as well. In 2007, uranium prices spiked to $136 per pound, reportedly helped along by speculators. With the current supply shortage, another price spike over $100 may be in the cards for 2011 and prices may stay elevated for some time. Cameco (headquartered in Canada) is levered to the spot price of uranium since its mining costs, averaging US$22.5 per pound in 2010, are relatively fixed. Given the China factor, I believe uranium spot prices could average US$100 per pound in 2011 and US$130 in 2012. Should this be the case, existing analyst earnings estimates are too low at $1.56 per share in 2011 and $1.99 in 2012. Building in the higher uranium prices into my earnings model, I calculate Cameco could earn US$2.35 in 2011 and US$4.93 in 2012. Multiplying my $4.93 2012 earnings estimate by the 18 P/E of the S&P Materials Sector gives Cameco a projected price target of 88, over a double from the 41 level it trades at today. On current consensus earnings estimates, the forward price to earnings for Cameco is 26, so applying an 18 multiple seems relatively conservative. In its latest quarterly report released Friday February 11, Cameco reported earnings of $0.48 per share, $0.20 better than analyst estimates of $0.28. Two analysts rate Cameco as a hold, and one a buy, so there is room for analyst upgrades to help the stock higher. Cameco management is optimistic about its prospects, recently raising its dividend 43% from 28 cents per share annually to 40 cents. Management’s recent quarterly conference call was up beat.